Extensive renovations were completed on this uptown YMCA branch located in One Wells Fargo Center. Updates to the 6,300 square foot lobby and new 1,900 square foot functional fitness studio are both visible from the Wells Fargo and Hilton corridors. Complete renovation of the raised cardio floor now offer members additional equipment, which includes personal viewing screens and internet capabilities. The renovations continue with updates to the strength training areas, gymnasium, as well as complete renovations to both the men and women’s locker rooms. New lighting, vibrant color and new specialty flooring throughout create an open and inviting space. 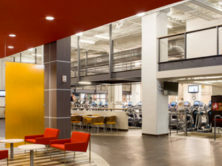 Updates made to the fitness bar offer members an area to socialize, eat, or conduct business.